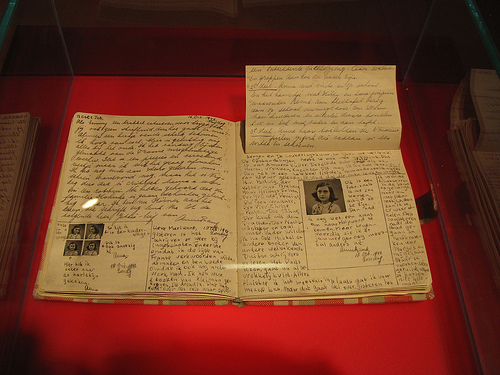 Our visit to the Anne Frank Museum in Berlin came as a happy chance, when you stumble across something interesting and decide to follow your instincts. We had been planning to make an early start to beat the queues at the Reichstag Dome, but walking past the museum we spotted the sign and as our girls were keen we went on in. I’m so glad we did, as it’s a small museum which brought to life the important subject of the Holocaust in a personal and non-threatening way. Into narrow courtyard and up the stairs we found a couple of rooms devoted to the story Anne Frank and her family. As Jews during the Second World War, they were forced into hiding in an attic in occupied Amsterdam, where they lived for nearly 2 years before they were betrayed. Anne and her sister and mother were separated from her father and were sent to the concentration camp at Bergen Belsen, where they died in 1945 not long before the Allied forces liberated the camp. Anne was given her diary for her 13th birthday and it became her lifeline and confidant at a time when she could do none of the things that a normal child would take for granted, like playing with friends and running in the fresh air. After her death, her father, who survived Auschwitz was given her diary and decided to publish it.